You're in a meeting, with eight other anxious souls, discussing the latest burning issue. Dale has just presented a proposal that's innovative, elegant, and creative. One by one, people raise questions about the idea. Well, not questions…they're more like objections. "What if X happens?" or "Does it deal with the Y problem?" or "Is it compatible with Z?" or "Can we can get budget approval?" And so on. 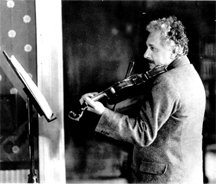 Albert Einstein playing his violin on his 50th birthday in 1929. In 1935, he published a paper with two of his research associates, Boris Podolsky and Nathan Rosen. The paper posed a problem in quantum mechanics which has become known as the EPR Paradox, and which has been debated ever since (though most physicists now believe the matter is settled). The debate of this question, much like most scientific debates, has been fairly symmetric, in that all participants contributed both proposals and objections with more or less similar intensity and formality. Science has little tolerance for the asymmetry we see in piecemeal analysis, which leads so often to incorrect conclusions. Photo courtesy Town Topics, community newspaper of Princeton, New Jersey. Read more about the EPR Paradox. Some objections have immediate answers. Most don't. Since the details are unknown, nobody has all the answers. Unanswered objections are added to a growing Issues List. Eventually the list becomes intimidating enough that some lose faith, and the initial optimism starts to fade. With momentum dissipating, someone suggests another approach, and promises to have a proposal tomorrow. Dale's idea is abandoned. Sometimes the opposite happens: we find answers to all the questions we can think of, and we think all is well when it isn't. I call this pattern of group discussion piecemeal analysis. It can mean the end for perfectly fine proposals, and it can lead to a "go" for some truly dumb proposals. Why? In this first part, we approach the question from a content perspective. In the second part, we examine the group dynamics of piecemeal analysis. Here are five ways in which the reasoning of piecemeal analysis might go astray. Since we see the objections as independent of each other, responding effectively to one objection leaves the credibility of the other objections intact. By contrast, because of the halo effect, flaws in one part of the proposal degrade the credibility of the whole. Since objections are independent, they and their implications need not be mutually consistent. Moreover, some objections, taken together, might have subtly inconsistent implications that we miss in a fast-paced discussion. What might seem to be flaws in the proposal might not be, because the conditions of the objections cannot all be met. Some objections seem plausible, but their conditions cannot actually occur. Yet, in error, we add them to the Issues List. They become part of the case against the proposal, almost as if they were demonstrably valid. When we rely only on the open discussion to analyze the proposal, we might overlook some material issues that are truly problematic, or we might reject them incorrectly. This is most likely when things are going well for the proposal. Would you like to see your comments posted here? rbrenKZRTUniOBIkSYiLvner@ChaclYujjNsbhIqTCSLJoCanyon.comSend me your comments by email, or by Web form. See also Personal, Team, and Organizational Effectiveness, Problem Solving and Creativity and Effective Meetings for more related articles. I offer email and telephone coaching at both corporate and individual rates. Contact Rick for details at rbrenEtfANEnXLXloOBFwner@ChacTAwDCsvSCiYJFtsEoCanyon.com or (650) 787-6475, or toll-free in the continental US at (866) 378-5470.